I’ve been finishing up open client projects this past week, or getting them to a good stopping point by Wednesday. That’s my last full day of work until the following Monday due to the move to the new house on Friday. This whole house hoohaa since spring sure has turned me every which way but loose. And it has certainly brought up a lot of similarities to running an online business. I ended up having to let go of some of the things I wanted to accomplish prior to moving in and do the things I was actually trying to avoid. Joe, my new contractor, took that whole roller coaster ride with me and I’ll be sticking like glue to him from now on. I think that’s the way some of y’all feel about me helping with your site success, and that really warms my heart. I’ve been through that same roller coaster ride with some of my site audit clients too. Doing the audit and seeing what was really going on with the site, and what was really keeping them from making money, changed their priorities on what they needed to do to put their site on a solid foundation. Many of my clients went from making no money to having a positive cash flow. And some went from making some money, but working too hard for it or being frustrated with their site management, to no site hassles and doubling, tripling, and in some cases, quadrupling their income. I’m also thinking about the GDPR hoohaa that hit in the middle of my house hunt. Some days you just have to throw down everything and jump on what’s hot and make it happen. Fortunately, for all of us who are so far ahead of the curve with what’s coming down the pike, we rarely have to put out fires like that. And when we do, we get through it in as calm a manner as possible. We don’t panic. We gather real data and make good decisions. The same thing happens with site audits. I just took a client through an audit and she had 5 sites. We only audited one site, but even it revealed issues with the whole hosting account that need to be addressed first. The priorities changed completely from speeding up that one site and a theme revamp to properly securing the whole setup and getting her on a reseller account so each of those sites could be placed in their own cPanel. And before that can happen, she will need to seriously think through how many sites she can actively maintain and drive traffic to them. Those will be the only ones that are kept and secured and made fast. And that’s what I’ve had to do with the house stuff too. Once we started trying to salvage the floors, we discovered just how bad off they were. Same thing happened when we ran down a leak in a sliding glass door. None of those things can be fixed. They simply have to be replaced. And I had planned to use that remodel money for other things. In the end, I’m going to be a whale of a lot happier having done things well and right at my new place, even if it means re-prioritizing the order of when they get done. And the inconvenience of doing some major projects after I move in. But, all of the things I’m doing are an investment that will pay for themselves. More than that, it’s a long-term solution and something I can enjoy the whole time I’m there. Instead of trying to salvage carpet, now I’ll have wood floors that will be easy to maintain and I won’t have to replace again. It’s the same way with putting a site on a secure and fast foundation. It’s a lot easier to keep it squared away. And after you get a deep education during a site audit, you’ll think twice about throwing some whiz bang plugin on your site without checking into it first for how it might slow down your page load time or chew up your database. And it will be easier for you to jump on the next edict from security or SEO or such, like HTTPS, and PHP version changes. But the biggest thing is, you can sleep peacefully knowing all is well and not panic and go over the cliff with the herd the next time something hits. Wouldn’t it be nice to just enjoy your site again? And have the support of me and a village that knows what the heck they are talking about? Yeah, that’s the way to do it!! Get Your Site Service Request in Now!! I’m almost booked up for October already, so if you’re thinking about getting a site service, fill out the form right away. This is the start of busy season for all folks who do site services of every kind and I’m betting I’ll be booked into November within a week or two from now. This is an eye opening article about Voice Search and is a big indicator of where things are going. 32% of consumers own a smart speaker and 71% of folks use voice commands daily. I’m betting a lot of that is via their phones. We’re all getting used to talking to our devices instead of typing. TV remotes that you can talk to are getting very popular now too. We did a workshop for Voice Search in the DIY SEO course this past spring. The replay is still there for members. And we’ll be going deeper into this, and formatting for Position Zero snippets as well when the 2019 workshops start up in January too. The more you can start formatting your content for Voice now, the better chance you have of being found while there isn’t a lot of competition yet. And that means more folks locking into your site for info instead of your competition. And that boils down to more tribe building and money for you in the end too. Being a tech site with so much content that is not evergreen, I sure wish to heck that Google would always display last modified date on my post. But, as Google’s John Mueller explains in his weekly webmaster hangout, Google will tend to show the original publish date unless enough major updates have been done to the post to warrant displaying the last modified date. Nobody knows what that trip point is. In my SEO 2018 from the Ground Up – Interview with SEO Consultant Brian Weiss we discussed the practice of republishing old content and this date thing. I’ve heard from some of my clients that this has become a common practice for seasonal sites, such as recipes and decor. 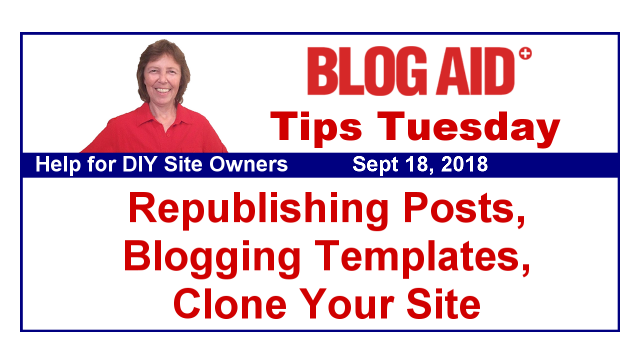 Republishing makes the post come back up on your home page and go out on your RSS feed again. But, if you don’t make significant edits to the post, it really doesn’t help your Google search result and will likely not get the date updated for you there. Plus, all of your comments will retain the original dates. So, after a while, it’s going to look crazy odd for your publish date to be a few years out of sync with the comment dates. And, if your post is ranking well, doing edits to it may tank that. Not to mention a Google crawl coming up with a 404 on the page while you have it in reschedule limbo. There are better ways to do this than republishing. If you’re on a Genesis child theme, it’s very likely that you can do a featured post section and display that post by post ID. And, you can send out an email to your RSS feed list. You can even use your RSS feed template. The process isn’t automated, but then you don’t have to manually edit the post either. Plus, your publish date and comment dates stay in sync. So, seriously consider not republishing unless you truly intend to massively update the post. That is the original intent of it, and who knows when Google will catch on to this trick and consider it gaming the system for the freshness ranking. While that may not be your intent, Google could most certainly take it that way. And it’s my bet that some non-SEO person invented this trick as an easy way to get seasonal posts to go back out on their RSS feeds too. When you cheat or cut corners, it’s going to come back on you some day. First it was schema markup in recipe plugins. Now Google is looking for schema markup on how-to posts. Now, the reason Yoast is promoting this right now is their inclusion of a Gutenberg Block that has this type of schema markup available. But, there are several plugins that have been available for some time that do the same thing. I’ll be looking harder into this next year as I plan to make a dedicated effort to getting my carving site back on track. In fact, I’m using it for all the screenshots and tutorials for the new Google Search Console class I’m making for the DIY SEO course. I’ll likely use it for the new Analytics course that is coming later in the year too. Ooooo, this is a really nice post from Darren Rowse on the ProBlogger site. If you’ve got posts that are doing well, it may not be just the topic. It may be the formatting you employed. Using a template is a good idea for structuring your posts so that you hit all of the strategic points and CTAs and such too. And, a checklist can ensure that you don’t miss adding things that you put in every post, like a CTA, or Call to Action, for something like your optin or related posts or such. So, hop on over to this post and see all the helpful tips from one of the greatest bloggers who has been showing the rest of us how it’s done for years. Thanks to webmaster and designer Michelle Phillips of Codefetti for the heads up on this new feature from the nice folks at UpdraftPlus. They now offer a Clone feature where you can migrate your site to a cloud sandbox for testing. It runs on tokens and you can get them for the day, week, or month. And, it’s only $12/mo, which is a little less than what I charge for a sandbox setup to do the same thing. Plus, it’s something you can do yourself whenever you like. I think this is great for most of us who don’t have a staging area at our host, which is actually below the public_html directory so bots and humans can’t get to it. The only thing that you’ll need to do extra is put a temporary license on your premium plugins if you need them to work on the sandbox. That’s important for testing for conflicts. And, you might need to disable any plugins that talk to the outside world, like Google Analytics or any automated posting plugins. So glad your home move will soon be over. And great advice on doing things the right way from the beginning instead of having to backtrack later on…even when its totally inconvenient to do them LOL! One of my webmasters put up a meme yesterday that said: If you don’t think you have time to do it right, what makes you think you’ll have time to do it over?